Our latest quarterly newsletter is available to view online! 10/11/16 - New "Luxury Eyewear" collections! Flair Couture - Those who are not just looking for a pair of glasses, but a work of art, will surely find what they are looking for in this collection. As extraordinary as art itself, as valuable as a brilliant thought; that's how fascinatingly these models are processed. The most luxurious materials are carefully and lovingly processed to create a complete work of art, among other things with 24 carat gold, rhodium, Swarovski gems applied in three layers, and in some cases gold and diamond dust refinements. The surfaces are artfully hammered, cross-brushed, textured or coloured by hand. FEB 31st - The idea behind FEB31st is a simple one: respect for nature and human ingenuity combined to produce something that is wonderful to wear and use. The sole aim of a FEB31st design is embody this idea in comfortable, attractive and modern frames.There is satisfaction and divine as well as earthly beauty in "making things". FEB31st glasses are entirely made in Italy. Feb31st conceive them, design them and make them combining the top class mechanical engineering and manual skills that allow every pair of FEB31st glasses to be unique. ​Our road safety depends on much more than just the vehicle or our individual skills behind the wheel. A key aspect is vision. Every driver knows that their vision may be compromised in the event of heavy rainfall, fog or snow. Driving at dusk or the headlights of oncoming vehicles pose a real challenge for many people. Rodenstock Road is the solution. 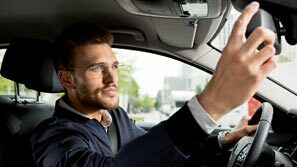 With the specially developed single vision and progressive lenses you are optimally equipped for the visual requirements of driving - for enhanced safety in road traffic. 13/9/16 - "Rocco" comes to visit! The guide dog puppy "rocco" we sponsored came for a visit to the practice today. It was fantastic to finally meet him and his puppy walker Vivien who says his training is going really well. He's a big fella for 7 months old and he will be off to training school in the not too distant future! 4 fantastic new additions to our children's lazer junior collection, all of which are supplied free with an NHS voucher. Lovely vibrant colours in these acetate frames and all come with sprung hinges as standard. Bloomdale Eyewear is an independent eyewear label based in the Netherlands. They design eyewear for people who want to wear an original design, with beautiful shapes, nice details and tasteful colour settings. ​The concept and philosophy of Bloomdale is to make glasses that make people happy and more beautiful when they wear them. You will love the simplicity of the screwless hinge enhanced by the progressive designs in Aluminium, Stainless steels and Tr90 materials which make this collection simply irresistible. Extremely lightweight with colours that will seduce, we can’t wait to share this exciting collection with you ……. Serengeti Eyewear has teamed up with the 24 Hours of Le Mans motor race to launch a limited edition sunglass collection in 2016. The specialist sunglass maker, a pioneer of photochromic and spectral control technology, says its high quality lenses and heritage gel naturally with the Le Mans’ iconic status as a motor race of technology and performance. As well as adjusting to light conditions Serengeti photochromic lenses with spectral control filter out the shorter blue light waves that cause atmospheric haze and glare reducing eye fatigue. After being part of the team at G R Hardwick (Optometrist) for just about 25 years, Lynette decided at Easter this year that it was finally time for her to take retirement. Lynette has major design plans for her new-found leisure time in the garden so staff clubbed together and presented her with a lovely garden statue and outdoor mirror along with some vouchers to spend on whatever else it takes to get her garden looking amazing. We also went out for a meal to celebrate the 25 years she has spent working with the company. ​Our sincere thanks and best wishes go with her during what we hope will be a long and happy retirement. 2016's new adidas Sport eyewear are now available. High-quality sports eyewear protects the eyes and ensures first-class vision. For sports enthusiasts who rely on corrective lenses, adidas Sport eyewear's RXO™ concept offers a range of options for optical correction. ​adidas Sport eyewear products are developed to meet the needs of various sports. Our product design engineers work closely with top athletes to develop our products. This achieves optimal results for adidas Sport eyewear which combines next-generation technology and lens innovation to create a personalized fit with sports-targeted technology. adidas Sport eyewear is, therefore, not just another pair of sunglasses, but an essential part of sports equipment that supports an improved performance. 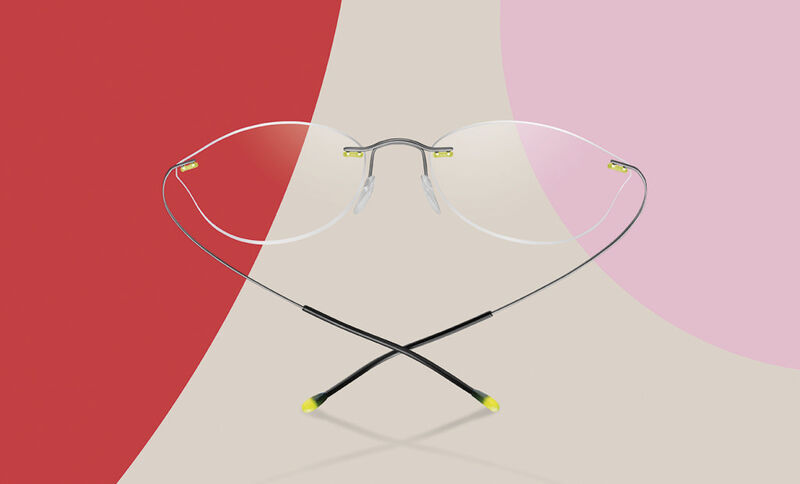 To celebrate reaching 10 million wearers of their TMA rimless frame, Silhouette are launching a new collection: TMA Pulse. A youthful, vibrant, spirited design rejuvenation of the classic TMA design. Fresh and daring, it is a perfect expression of the times. Available in 12 vivid colours and lens shapes. 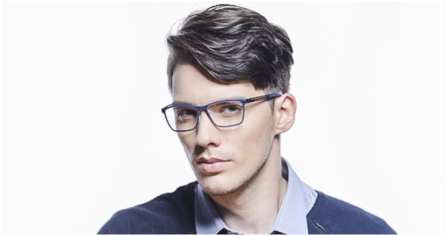 Vividly coloured plugs and end tips appeal to a younger, broader audience.Quirky lens shapes, including beautiful, over-sized, upswept cat-eye shapes and on-trend round lenses, show a new direction in rimless. ​TMA Pulse retains the classic structure of a TMA; streamlined wrap-around temples made from pure titanium, soft touch SPX tips made from patented, polyamid composite, and a weight of only 1.8g. On the back of their considerable knowledge of the cycle market, acquired over the past 40 years, and their know-how in the ski helmet market, Bolle have launched their first collection of cycle helmets, all available from GR Hardwick. 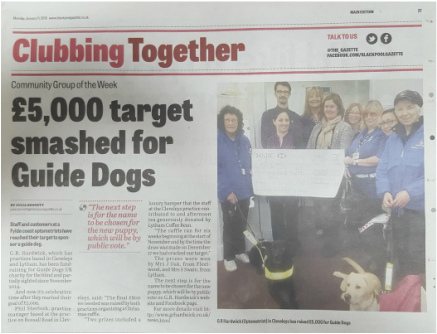 Following our fundraising efforts since November 2014, we are delighted to be able to announce that we have reached our target of £5000 to sponsor a Guide Dog Puppy!! Many thanks to everyone who helped us achieve this landmark. Thank you to everyone who voted for our puppy name. We are now waiting for a little Rocco to be born. Congratulations to Sarah Jones who is the winner of our "Name the Puppy" free draw and wins £250 to spend at the practice on some fantastic new specs or sunglasses. Rodenstock has named BBR Optometry as the 2015 Rodenstock Centre of Excellence, at its prestigious annual awards ceremony. The Hereford opticians, who retained the award, was presented with the trophy for overall best-performing practice for 2015. Burnett Hodd & Jenkins, Sidcup was named runner-up in the Centre of Excellence, while Peepers, Banbury came third. More than 250 Rodenstock Club members attended the lunch and awards ceremony on 16 December at the Jumeirah Carlton Tower in Knightsbridge, where practices from across the UK competed in a number of product specific categories. The luncheon was attended by Phil Sherlock, Julia Blundell & Julia Stanley and although G R Hardwick (Optometrist) didn't win any of the award categories, we did feature in the top ten of 4 of the 10 different awards, including the UK centre of excellence. ​Orthokeratology (ortho-k) is the fitting of specially designed gas permeable contact lenses that you wear overnight. 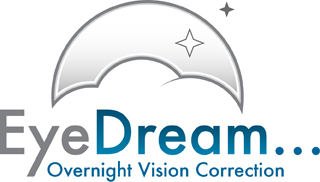 While you are asleep, the lenses gently reshape the front surface of your eye (cornea) so you can see clearly the following day after you remove the lenses when you wake up. Read the full article about how the fitting of these lenses, by Drew Thompson, changed the life of one of Blackpool Vic's consultants. We are excited to bring you three new women's crystal collections from Silhouette. The "Light Attraction", the "Sparkling Finesse" and the "Caresse". All these eyewear collections are crafted from 23 carat gold-plated titanium; they are rimless and hand-finished with precision in Austria. ​Feel free to drop in and have a look at these fantastic new creations from one of the leaders in quality eyewear. The Association of British Dispensing Opticians (ABDO) and ITN Productions have continued their unique communications partnership by producing a news and current affairs style programme for 2015 called ‘ABDO INSIGHT’ capturing the latest innovations and best practice within the eye care sector. 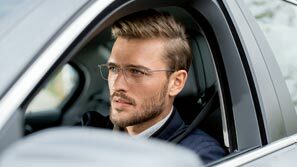 The news-style piece combines key industry and sector interviews and Rodenstock were pleased to contribute with a focus on the importance and safety of vision whilst driving at night with the benefits of DNEye® Scanner. The second match of 10-pin bowling (at 1st Bowl, Market Street in Blackpool) took place on Tuesday night. The rematch was a lot of fun and we raised £106 with a "guess the puppy's name" scratchcard and raffle. Congratulations to our clinical assistant Alison who won the prize for the highest total of the evening and also to "Team Tiny" Phil, Sharon, Jo & Sue for the highest team total of the evening! We look forward to the next one! Playing sports in a club or school exposes young athletes to various risks, in particular eye injuries. For this reason it is imperative to wear protective eyewear specifically designed for sports. At G R Hardwick (Optometrist) they are available for £99 including lenses. 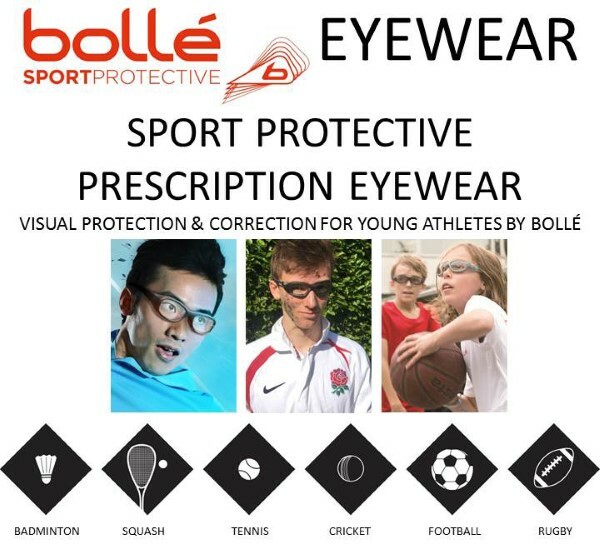 Bollé Sport Protective eyewear complies with EN 166 and ASTM F803 safety standards, even when corrective lenses are incorporated. 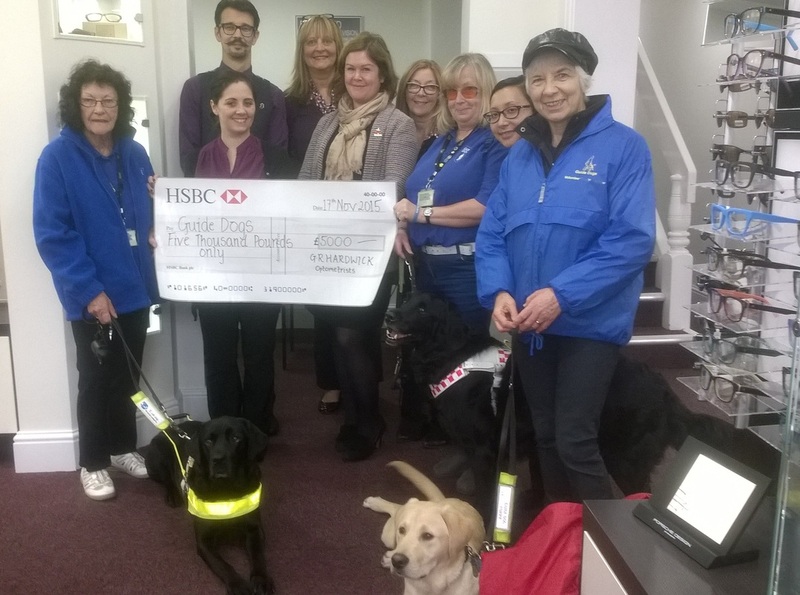 Since November 2014, here at GR Hardwick Optometrists we have been trying to raise £5,000 for our chosen charity Guide Dogs UK, this enabling a puppy to be trained for 12 months before they go on to full Guide Dog training. On Saturday 19th September we hosted our first ever outside event, in partnership with SILHOUETTE and RODENSTOCK. Around 80 guests enjoyed 'A Night at the Races' at the ASHLEY CLUB in Thornton. We also held a raffle on the night with prizes donated by Morrison's, Strawberry Gardens, Iron Horse, Jolly Tars, Le'Roy Mark Hairdressing and Regan's Beauty Room. The evening raised over £1,200 for Guide Dogs, taking our total raised so far to £4,200. Thank you to all those who made the night such a success and if you would like to help us reach our goal, feel free to pop into the practice and make a donation. 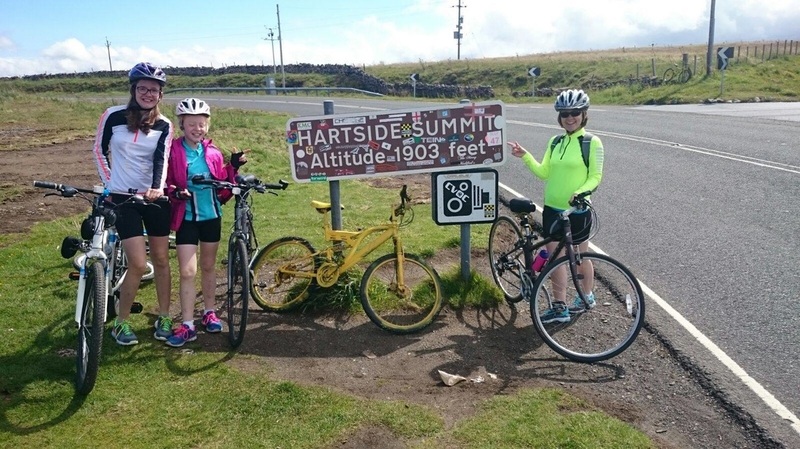 Between 17th & 21st August, one of our Optometrists Kate and her family cycled the Coast to Coast ( C2C route ) Bike ride from Whitehaven to Tynemouth raising money for Research into Rare Diabetic Conditions. A big thank you to everyone who sponsored them and to Rodenstock for their very kind and generous donation - they raised an amazing £3,500!!! Our recent Open Day, in partnership with Rodenstock, to celebrate 12 months since our Cleveleys Practice underwent a major refit was a fantastic success! As well as over 60 people calling in to see the full range of frames that Rodenstock has to offer, local Guide Dogs UK fundraisers ran a stall outside to raise awareness and funds. The total raised for them by everyone who took part was around £650!! Mrs N Norton - Beauty pack & vouchers courtesy of "Essential Beauty with Toni". Miss B Rushworth - Free pair of Wimbledon prescription sunglasses. Miss P Donaldson - Guide Dogs cuddly toy. Mr J Huckerby - £25.00 on the "Name the Puppy" scratchcard. Mrs J Crawford - £25.00 on the "Name the Puppy" scratchcard. Our DNEye® Scanner automatically and highly accurately measures high and low order aberrations for far and near vision. The measurement is also dependent on the pupil size. Far more data than usual is recorded so that you can use 100% of your personal vision potential. Thanks to DNEye®, you simply see sharper and with higher contrast, which is noticeable at dusk in particular. The greatest comfort and the best compatibility make the vision experience perfect. After over 10 years with the company working at the Lytham practice, our Optical Assistant Lynne has retired. We would like to extend our thanks to Lynne for all the hard work she has put in over her time with us and hope she has a long and happy retirement.